A week or two Governor Paterson seemed to imply that State budget cuts would halt the Kosciuszko Bridge project before it even got started (um, aren’t we supposed to be spending stimulus money on infrastructure projects?). 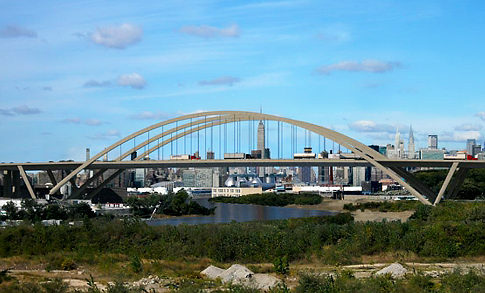 Now, the Daily News and Brooklyn Paper are reporting that the $1 billion replacement bridge is going forward. Here are two of the designs that are supposedly on the table (the cable-stayed design is apparently the favorite, though I’m not sure I like the bow-legged towers). Thoughts? I do hope the top one gets built. Reminds me of Sydney!